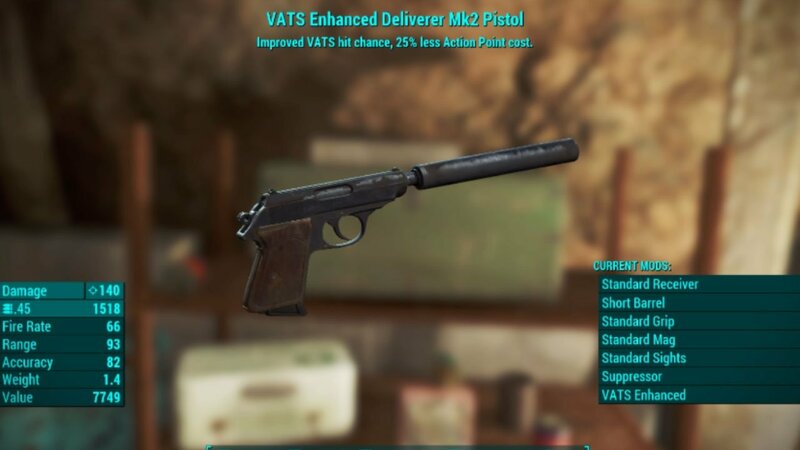 Fallout 4 really excels when it comes to weapon mods. It’s where a lot of modders will focus their skills. Unfortunately, due to Sony & PS4s strict guidelines, weapon mods don’t do too well here as you can only edit existing items. You aren’t able to use external assets. 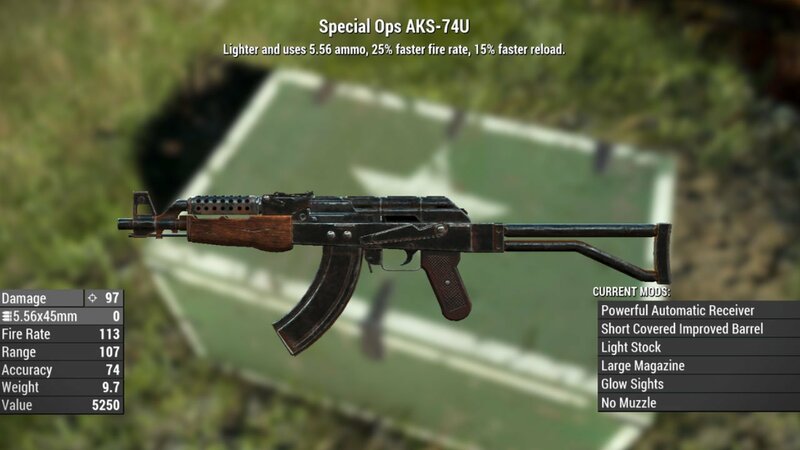 Either way, we’ve given a run down of some of the best weapon mods for Fallout 4 currently available on PS4. A mod that is intended to help you early game is ‘Cheat weapons’. It places various over powered weapons around the Vault 111 elevator in Sanctuary. You can always leave them hanging round until you need one for a mission. 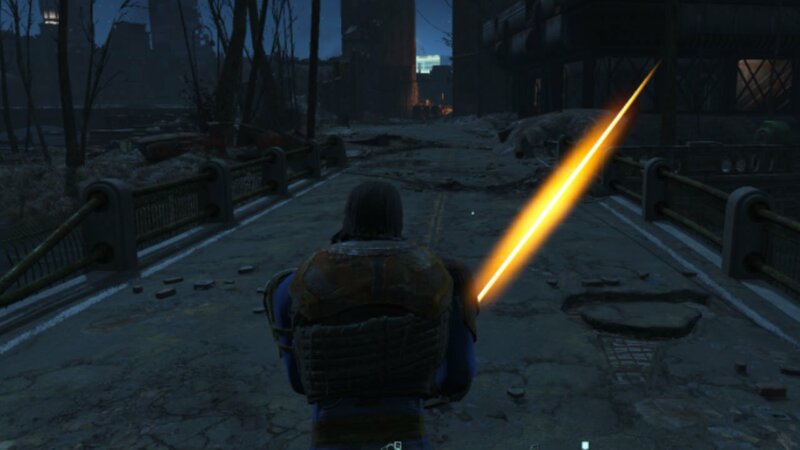 Again, we have another mod that will provide some weapons and armor around the Vault 111 entrance in Sanctuary. Located in a trunk, you can find a Special Ops AK Rifle, Doomsday outfit, Ultra-stim medication that remove all debuffs and a Big Game Rifle for larger enemies. 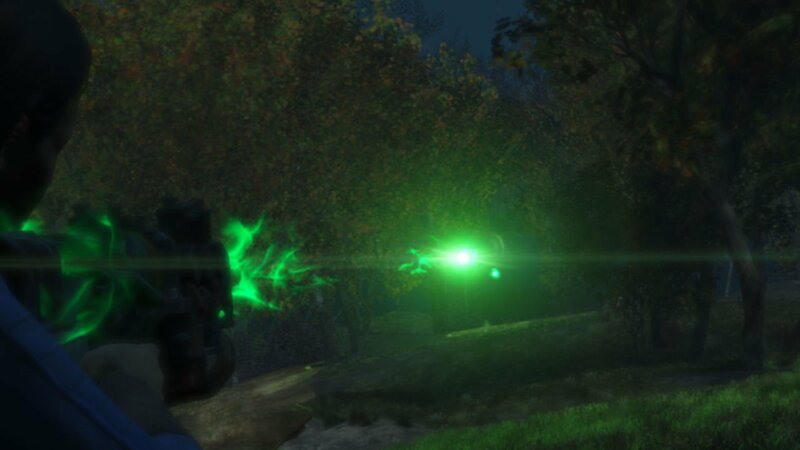 What this Fallout 4 mod does is change the appearance of light when coming from weapons and explosives, such as bullets, lasers, gauss, plasma, missiles and flares. Currently, the mod doesn’t work with any DLC weapons, although the developer plans to do so in the future. 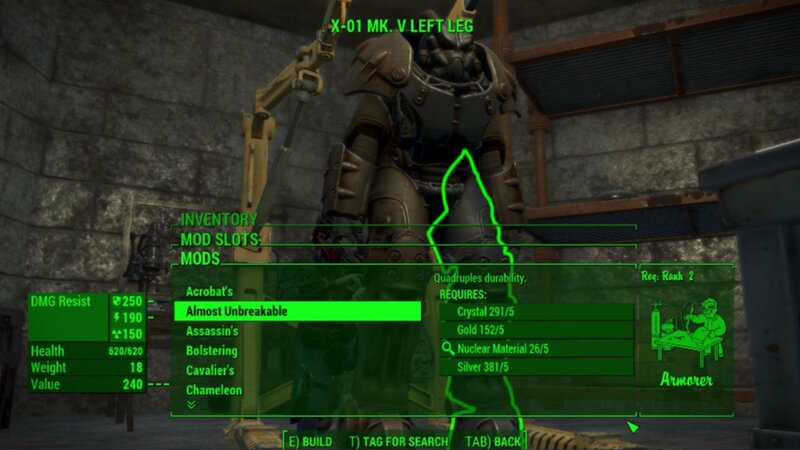 This mod allows you to attach any Legendary Modification to a weapon or armor piece of your choice. Using a weapons or armor workbench, you will be able to craft your own legendary items with this mod. If you want to use this mod with DLC, you will need to download the extra add-ons from the developer. Inside Hubris Comics on the top floor, you can find this movie prop, ‘The Lite Sword’. Usable as a weapon, it comes with custom equip and unequip sounds. Lite Sword does energy damage and will ignore other enemies armor values. 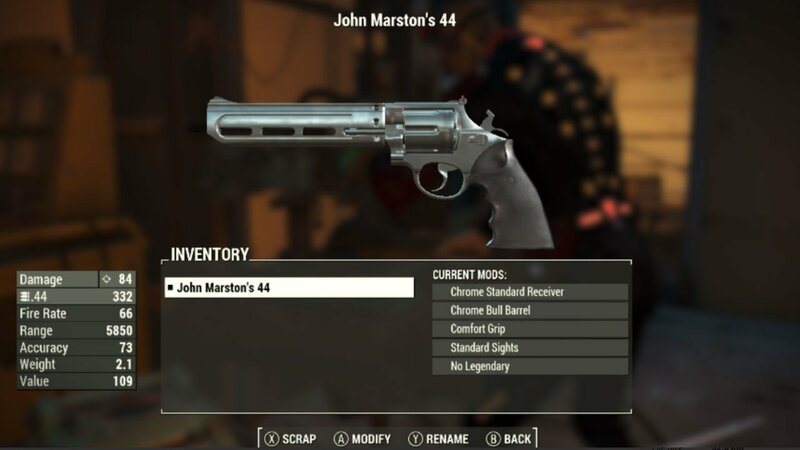 What’s great about the John Marston 44 mod is some of the unique abilities it has. It has 3 different choices, with the main being called ‘Seeking bullets’. When pointing this weapon near an enemy, a recon will appear above their head. Shoot the gun and the bullet will follow the enemy, so you don’t actually need to aim at them. Otherwise you can use the Dead Eye attachment, which will slow down time when aiming. A very unique weapon overall. 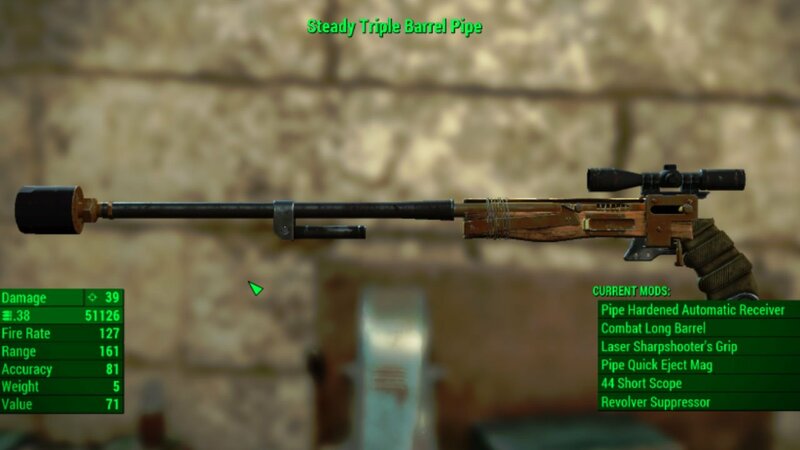 This very useful mod adds scopes to all the vanilla weapons, with two different magnifications, 2.5x and 4x zoom. They are called ‘Combat scopes’, and can be crafted at your weapons workbench. 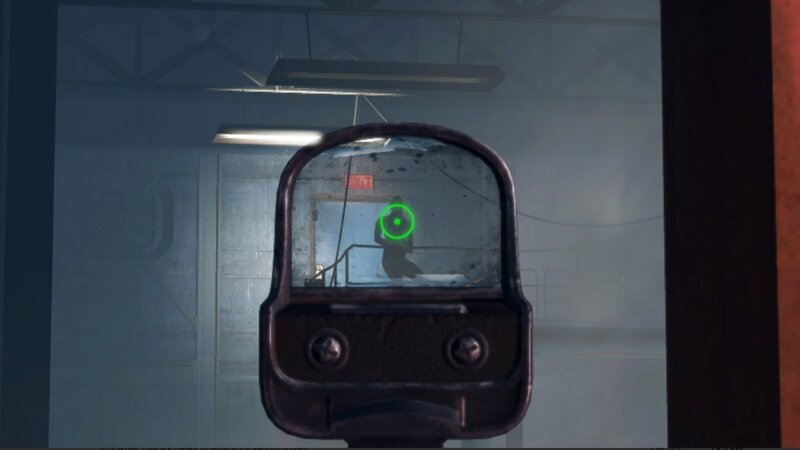 These transparent scopes make aiming much more fluid and simple. They won’t be found on NPC’s or containers within your world unfortunately. 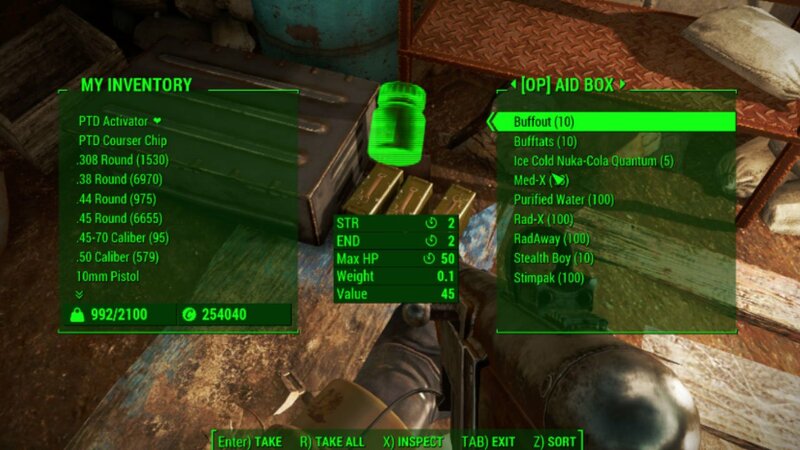 Inside the Root Cellar in Sanctuary, you will find an OP Weapon container upon installing this mod. Inside are some overpowered weapons, armor and medicine intended to help you stomp through the early game. 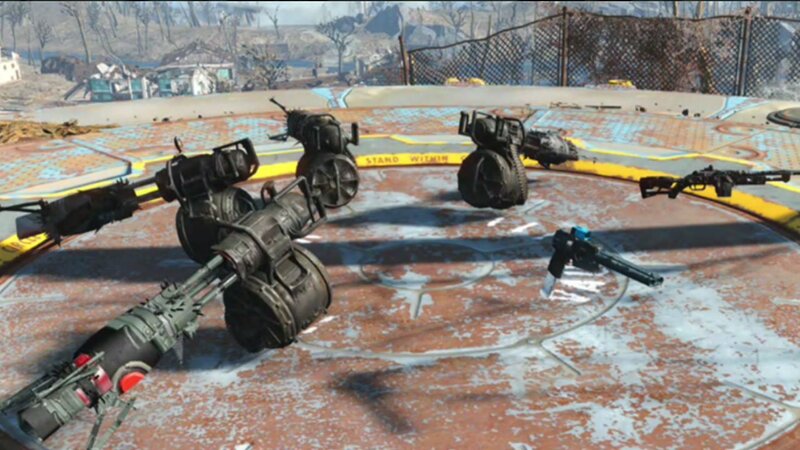 The Wacky Weapons mod essentially allows you to create any weapon type you want in Fallout 4. There are some limitations of course. Intentionally created as a development tool, the create decided to release it to the public for ‘silly short time fun’. This mod works with both non DLC and all DLC.